Having an established process is important. It ensures a greater chance of success no matter how different the needs, styles or restrictions are for a project. Our process seeks first to establish the absolutes before narrowing in on the relative elements. The final result should be a perfect blend of your needs, your wants, our skills, and cutting-edge modern technologies. The discovery phase is all about identifing your specific needs, primary message, and a clear look and feel. Before we dig into the details of the project, we seek to establish a general understanding of the scope of the project and the needs of your business, so we can determine how best to accomplish your goals. While we might not become experts at what you do, we do strive to gain enough of an understanding so that we can best meet your needs for your website or web application. Once we’ve become familiar with your business, we will start to narrow in on the knowns and unknowns of your project: are there specific requirements, certain pre-existing materials that need to be included, or anything that you want to avoid from the start? Wireframes are usually the last step of the discovery phase where we rough out the structure of your website or app in a way that shows the user flow and general layout without narrowing in any specific design elements such as colors or styles. Implementing discovery phase materials into design drafts and full fledged mockups. The design phase really begins when wireframes are approved and we begin to narrow in on specific colors, style elements, and types of layouts (if not already discussed). Typically we work up an initial design draft that includes a main page, subpage, and sometimes one other type of page – however depending on the size of the project sometimes we will draft multiple design paths with more options within each before narrowing in on the final design. Once the first draft is completed we will work back and forth to narrow in on exactly what is wanted before the design is approved. During this phase we will often request various media such as the logo (if one exists prior), photos, existing print materials, etc. Once the design is approved it’s time to begin developing the site itself. Development and integration of the finalized design into code. 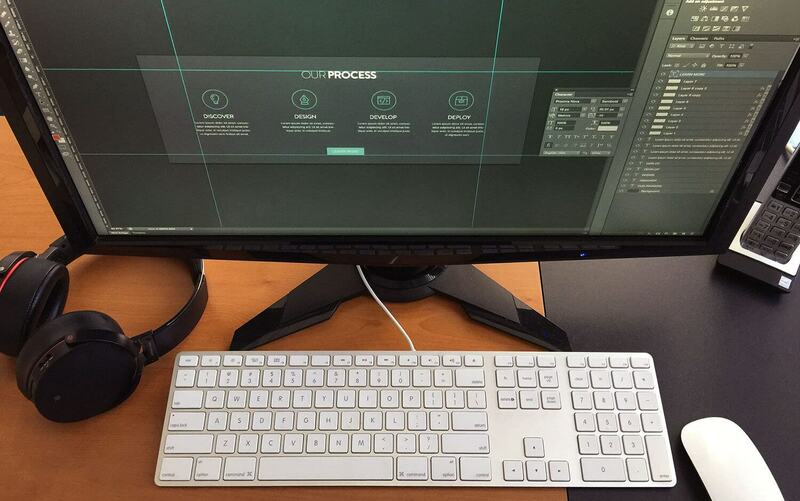 Fine tuning structural flow, user experience, and responsive layouts. Development of the site or app begins with setting up a space on the server for the site to live. Once the initial framework for the site is installed we will begin converting the design into code that is responsive, lightweight, and uses modern coding standards. The development phase is when we will require the site’s written content as well as further details as we work through setting up each page on the site or app. When this is completed we will have a fully functional site that is mobile friendly and compatible in all major browsers. Final testing, compatibility, SEO optimization is implemented. The project goes live and is complete! Before we can take the website or application live there are a number of things that have to happen. First we work through your SEO package to ensure that your new site ranks well. We then setup the proper security protocols and then test the site. The amount of testing depends on the project and can range from a simple click through of all of the site’s pages to more in-depth form & API testing, auto-generated PDF print testing, and user path testing for custom registration processes. Once testing is completed and the site is fully approved we will run full backups of any existing material and the new site and then move it into place so it is publicly accessible. After we’ve gone live we will run through the site again to make sure there are no issues that arose from moving it to a live environment. Ready to begin your project with us? Updates and security monitoring, SEO improvements or even future phases of a project. Once a project is completed, we will continue to offer our services in a support capacity. This can be general updates and security monitoring, to SEO improvements or even future phases of a multi-phase or soft-launched project. We also perform server maintenance/improvements, software version updates, and load monitoring.